La tour de Nesle: A rather slow swashbuckler film only made watchable by the presence of Pierre Brasseur. Senza ragione: A crime flic I watched in Italian. Normally the Italian versions of these things are better than the English, but here Telly Savalas was dubbed with such a stupid voice….But Franco Nero was good. 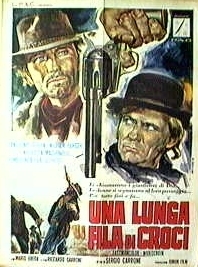 Una lunga fila di croci: A very good Italian western. One of the best films I have seen Anthony Steffen in and William Berger does an excellent job as a bounty hunter with a very elaborate gun. Mare matto: A very good Italian film starring Jean-Paul Belmondo and Gina Lollobrigida. Definitely should be put into English on DVD. Un ettaro di cielo: A great film with Marcello Mastroianni. A perfect candidate for English language DVD release. The Betrayal: This samurai film has to have the bloodiest final scene of any I have ever seen. The character played by Raizô Ichikawa kills at least 100 men by himself. Uccidite Rommel: A pretty decent Italian war film. Parola di ladro: A very good caper/comedy. Another film that deseves wider recognition. Di Tressette ce n’e’ uno, tutti gli altri sono nessuno: The second film in the two-film series. A crazy and pleasant comedy spaghetti western. Revolver: Sergio Sollima, Oliver Reed and Fabio Testi. A very good cop film. La Volpe della coda di velluto: A not quite fullfilling giallo, but worth a look for fans of the genre. Vacanze per un massacre: A very satisfying Italian thriller. One of director Fernando Di Leo’s last efforts. All’ombra di una Colt: A good western. Well, a mediocre western, truth be told, but the music, by Nico Fidenco, elevates it beyond what the actors or script are able to do. Pride and Glory: Was this supposed to be a good movie? Maciste nella terra dei ciclopi: If you can get beyond the annoying music, this one isn’t half bad. Il Paese del sesso salvaggio: A good film. It is a shame that it is on the “must see” list of cannibal films, because I think that crowd can’t really appreciate all the interesting non-cannibal moments. The Game: I thought this Korean thriller was pretty interesting. Great acting and very good production values. Un Treno per Durango: A great western, starring one of my favourite actors, Enrico Maria Salerno. This film is funny, but in a good way. Probably the best film I have ever seen seen Anthony Steffen in. Bluff, storie di truffe e imbroglioni: Really one of the best comedies I have seen over the past year. Yeah, it was made in 1976. But there is nothing dated about Adriano Celantano and Anthony Quinn. One of director Sergio Corbucci’s better efforts, and that is saying a lot. Domenica è sempre Domenica: A very good comedy starring Alberto Sordi, Ugo Tognazzi and Vittorio De Sica. Probably not in English, but it should be. The Dark Knight: I had heard this was good. It wasn’t. No plot. No script to speak of. A bunch of uninteresting special effects. Incredibly boring. 1) A very nice score by Felice Di Stefano. 2) Good cinematography by Vitaliano Natalucci. I have never seen a film with so many crooked-angle shots. Probably about a third of the film is like this, which makes for interesting viewing. You are currently browsing the archives for the Spaghetti Westerns category.